between 540 and 550 and was buried in the same grave as his sister, Scholastica. No personality or text in the history of monasticism, it has been said, has occasioned more studies than Benedict and his rule. The major problem for historians is the question of how much of the rule is original. This is closely related to the question of the date of another, very similar but anonymous, rule for monks, known as the “Rule of the Master,” which may antedate Benedict’s Rule by ten years. This does not detract from the fact that Benedict’s firm but reasonable rule has been the basic source document from which most later monastic rules were derived. Its average day provides for a little over four hours to be spent in liturgical prayer, a little over five hours in spiritual reading, about six hours of work, one hour for eating, and about eight hours of sleep. The entire Psalter is to be recited in the Divine Office once every week. At profession, the new monk takes vows of “stability, amendment of life, and obedience.” Pope Gregory the Great wrote Benedict’s “Life” in the second book of his Dialogues. 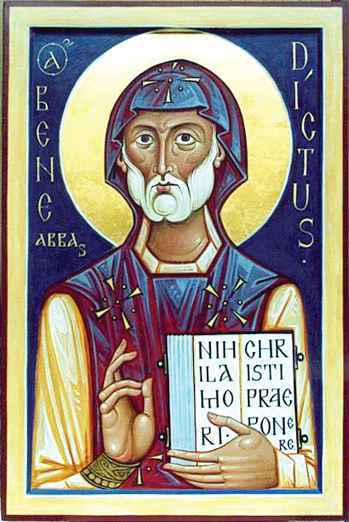 He adopted Benedict’s monasticism as an instrument of evangelization when in 596 he sent Augustine and his companions to convert the Anglo-Saxon people. In the Anglican Communion today, the rules of many religious orders are influenced by Benedict’s rule. deteriorating culture of his day is good to read about now. An excellent commemoration and bio. Benedict has left his mark on the entire Western Church and it is benedictine Spirituality that shapes classical Anglicanism. Making sure to mention that there is no evidence of his ordination helps us understand the nature of what he was doing. This is a key commemoration for the Catholic and Reformed faith of Anglicans. I enjoy saying his office tomorrow. An excellent nominee for LFF. Line 13, first paragraph: substitute “composing his monastic Rule there about 540” for “and, about 540, composed his monastic Rule”.